Congratulations to "Amy R", the winner in Cindy's giveaway. Thank you to all who participated! 1.) As per the nature of this site (JUST ROMANTIC SUSPENSE), I have to ask what draws you to this particular genre. 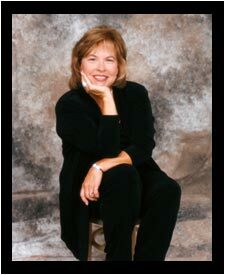 Authors like Nora Roberts and Lee Child and Linda Howard have always been on my TRB shelf. I love a good suspense. Add romance to the mix and it’s a perfect reading combo and, I’ve found, writing combo for me. I wrote contemporary romance for years and loved it but the suspense element called to me eventually and it turned out to be a good fit. 2.) You have traveled to many exotic destinations. Do you draw upon those travels often in your books? I have not traveled as extensively as I’d like to – there are these things called deadlines that keep me in my office most of the time LOL. And the truth is, I’ve yet to set a book in a local that I’ve visited outside of the country. That doesn’t mean that I don’t plan to someday, but for now all the books I’ve set in places like Peru, Argentina, Sri Lanka, Sierra Leone and all those other places, have been researched on line. 3.) Do any of your travels or methods of research put you in any danger? 4.) Tell us about the One-Eyed Jacks Series. What inspired you to go 'edgier'? I am so looking forward to the publication of this series. The One Eyed Jacks (a multi-branch military task force formed in 2002 and disbanded in 2005) got their nick name because of the uniqueness of their experimental unit, their tight camaraderie, their slightly reckless reputation, their favorite downtime/pastime of high stakes poker and because each of them made a pact to always carry a One Eyed Jack playing card (either a Jack of hearts or a Jack of spades) as their lucky charm and a sign of unity. Today, only three men of the original detail are still alive – Mike Brown, Bobby Taggart, Jamie Cooper. On their last mission in Afghanistan, all three were dealt a losing hand and now share one common bond: The military that they proudly served had cut them loose eight years ago with a ‘less than honorable’ discharge when their team led a covert operation that went south and the powers that be laid the blame squarely on their shoulders. Now Brown, Taggart and Cooper lead separate lives in separate countries, have all dropped out of ‘normal society’ and not only live with the lie that led to their military separation but with the weight of the deaths of both their task force team members and several innocent civilians haunting them. For these three men, life is now all about getting by, about forgetting the past, dealing with the anger and coping with the hand they’ve been dealt. None of them intend to break the status quo – until a mysterious woman confronts and forces Brown to ask questions about what really happened in Afghanistan and how those events played into a current national security threat. She dangles bait Brown can’t resist – the means to clear his name, deliver justice and expose the master mind behind the death of his teammates and his own downfall. 5.) Which four-legged companion is most often by your side as you write? My critters are a fickle lot. LOL Some days, my little tuxedo cat, Sly, insists on stretching himself across my desk, right in front of my computer screen. Other days, Buddy, the yellow cat, has to be either on my lap, or lounging ½ on my desk and half on the window sill. Then another day Margaret, the Brittany spaniel will curl up on the loveseat near me. Some days, all 3 of them are competing for attention. 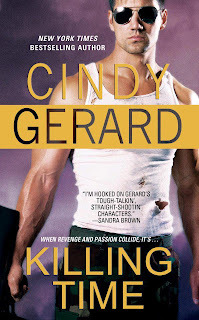 Cindy is giving away a signed paperback of LAST MAN STANDING to one person leaving a comment, a question, an email, or a 4-legged critter tale! 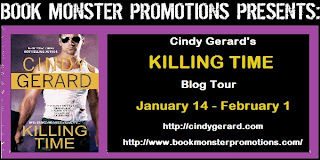 There is also a Grand Prize drawing of a $25.00 Gift Card (Amazon or B&N) and an autographed copy of KILLING TIME for one lucky winner that follows the tour and leaves a comment at every stop. To enter the Grand Prize drawing CLICK HERE! For the seven years after Operation Slam Dunk went south, Mike Brown got drunk on each anniversary. The eighth year was no different--until he was drugged by a woman and woke up to her questions about what had happened eight years ago in Afghanistan. CIA attorney Eva Salinas has her own theory behind what happened to Mike's team--which included her husband--in Afghanistan eight years ago, and she's determined to prove foul play. Though she doesn't trust him, Mike is the only person she can turn to for help. Under an assumed name, Eva convinces Mike to assemble a new team and go after the traitor who screwed up both their lives. As they track down the rogue who started it all, Eva and Mike discover they can't live without each other. But can they stay alive while an enemy is still on the loose? Giveaway ends 11:59pm EST Jan. 16th. Please supply your email in the post. You may use spaces or full text for security. (ex. jsmith at gmail dot com) If you do not wish to supply your email, or have trouble posting, please email maureen@justromanticsuspense.com with a subject title of JRS GIVEAWAY to be entered in the current giveaway. US and CANADA mailing addresses only. Hey Aly and Linda. thanks for stopping by and for the kind words. Good luck in the giveaway!! I loved your Body Guard series and the Black OP series. I can't wait to dive into The One Eyed Series. Keep up the wonderful books! Love the cover of this book. You are a new author for me. I love to read and always looking for new authors to check out. Are you going to write a book for each guy? Just the 3 books total or more in planning? Any other new books or series in the works? OT but....speaking of Lee Child, did you see the new movie JACK REACHER? Mr. Child was very pleased with Mr. Cruise's portrayal of Jack Reacher and of the film in general. I thoroughly enjoyed it and recommend it to all of my friends. Love the cover on KILLING TIME! I did see the movie REACHER. I've got mixed feelings about it but over all it was good! I just never saw Tom Cruise in the role, I guess. Not sure who I pictured but it wasn't him. I haven't read any of your books before, but these sure sound good. I will have to add these to my TBR list! Thanks and nice post, Cindy! thanks Amy. Hope you give them a try and if you do that you enjoy them. To Chrisbails and Jbiggar - thanks ladies. And about the number of books in the One-Eyed Jack's series -- while I had initially planned to write 3 books I’ve since been given the opportunity to write a 4th book, one that will come out next December (just in time for Christmas!!) that’s a bonus book in the series. I’m so excited about THE WAY HOME. It’s a homecoming story featuring Tyler Brown (Mike’s brother who we met in LAST MAN STANDING) and is a little different book than I usually write. Still romance, still suspense, still features our black ops warriors, but THE WAY HOME has a little something extra ... something that is leading me on a very special journey as I write it. Looks like a fantastic read! Sandie, Colleen and BN - thanks!! I loved the interview and have already read, and re-read a lot of Cindy's books. I am part of her facebook team and won a copy of this book. I sat down to read a few chapters and never stopped until I was done. GREAT STORY...now I need the next one. I never tire of her stories and she is one of my authors I have flagged on Amazon for all new releases. She is also someone who gave me some much needed advise last year, and because of her kindness I was able to write a book myself. Great interview from a great author. Good luck with the rest of your blog tour, but I already know this book will be a best seller. The body guard series was fantastic and this series sounds like it's going to be a winner also!! Can't wait for this series. I loved the BOI series. Love the combination of "rogue" military and romance. The characters just come to life in them. Sounds fantastic! Thanks for the fun interview and congrats to Cindy on the newest release! I enjoy romantic suspense and especially military related stories. I would love to read this series. I don't have any pets to deal with, I mean my daughter has two dogs but they are so attached to her that they don't have much to do with anyone else. Unless you have food that is. I feel like I've been a fan for a long time and I have enjoyed all of your books (we won't actually talk about how long!). I've been looking forward to this new series and it's finally here - yippee!! We don't have any dogs but do have two cats. One will kill spiders and scorpions and then make sure we know about it so she can get rewarded - and she definitely is! I started reading your books. I love them. Thanks for the giveaway. I don't have any 4 legged critter tales. Only a silly 50 pound dog who is afraid of everything and thinks he is a lap dog and a chica cat who totally intimidates him. haha I am reading the boi series now. As recommended to me. Very good so far!! Thanks!! sounds like a great series. thanks for the giveaway! So will all 4 books be out this year? Wow! This sounds AWESOME! I can't wait to read it.